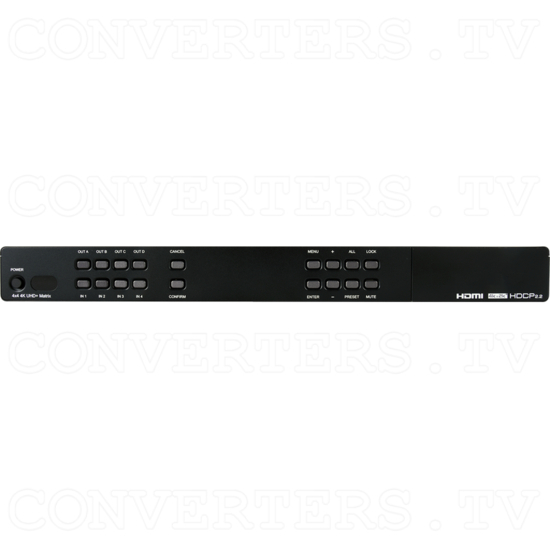 ​The 4x4 HDMI Matrix UHD 6G with USB Line Extenders provides the ability to connect up to four UHD 4K sources to four UHD 4K HDMI displays and freely switch between them. This 4x4 HDMI Matrix UHD 6G with USB Line Extenders provide full support for 18Gbps (600Mhz) resolutions up to and including 4K@60Hz (4:4:4, 8-bit), as well as support for 48-bit Deep Color, HDR (High Dynamic Range), HD audio and other features defined by the HDMI 2.0 specification. A comprehensive EDID management feature thas the ability to select between stored default EDID's, EDID's copied from connected sink devices, or configurable EDID's. The 4x4 HDMI Matrix UHD 6G with USB Line Extenders can solve many interconnectivity problems. A bonus feature of the 4x4 HDMI Matrix UHD 6G with USB Line Extenders are four USB ports which supply up to 5V/1A power for use with connected optical fiber or AOC fiber cable extenders. By using Optical cables, your HDMI content can extend much further than with normal HDMI cables. The bUser friendly OSD displays User-editable general information text so each output can display up to 2 lines of customized text on top of the video source in the color of your choice. 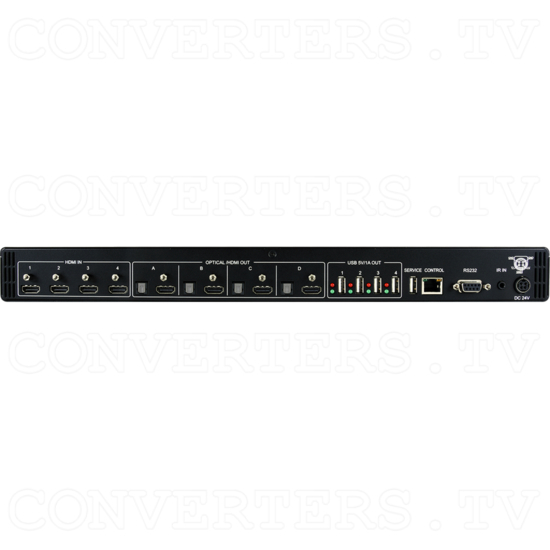 The 4x4 HDMI Matrix UHD 6G with USB Line Extenders unit provides front panel control buttons, as well as RS-232, Telnet, WebGUI and IR remote control options. This 4x4 HDMI Matrix UHD 6G with USB Line Extenders provide full support for 18Gbps (600Mhz) resolutions up to and including 4K@60Hz (4:4:4, 8-bit), as well as support for 48-bit Deep Color, HDR (High Dynamic Range), HD audio and other features defined by the HDMI 2.0 specification. A comprehensive EDID management feature thas the ability to select between stored default EDID's, EDID's copied from connected sink devices, or configurable EDID's. The 4x4 HDMI Matrix UHD 6G with USB Line Extenders can solve many interconnectivity problems. A bonus feature of the 4x4 HDMI Matrix UHD 6G with USB Line Extenders are four USB ports which supply up to 5V/1A power for use with connected optical fiber or AOC fiber cable extenders. By using Optical cables, your HDMI content can extend much further than with normal HDMI cables. The bUser friendly OSD displays User-editable general information text so each output can display up to 2 lines of customized text on top of the video source in the color of your choice. 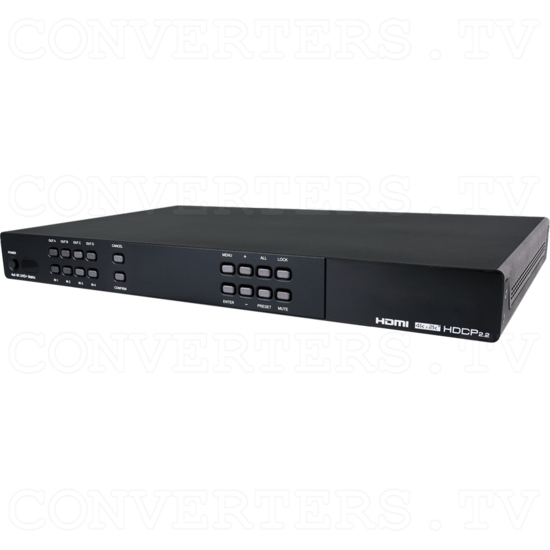 The 4x4 HDMI Matrix UHD 6G with USB Line Extenders unit provides front panel control buttons, as well as RS-232, Telnet, WebGUI and IR remote control options.